When I started this post, it was about Harvey’s aftermath. Now, nine days later, Irma has come and gone. On aggregate, the storms dumped about 40 TRILLION gallons of water on the US– an incomprehensively large number that represents the magnitude of record-obliteration by these two storms. Texas is only just beginning to deal with the aftermath of Hurricane Harvey, while a third of Florida residents still don’t have power. Harvey claimed the lives of at least 70 people, and Irma at least 69. This storm has already caused gas prices to rise* because the Gulf is home to fifty percent of our refining capacity; it’s an obvious reminder that what hurts one of us, hurts all of us. What about other industries, though? Specifically, what about Gulf Coast fisheries? Maybe it seems silly to contemplate fish when the bill to rebuild is hundreds of billions, and people are dead. “Life goes on,” we say, which is both cruel and true, and it’s why I’m bringing this up. As we catalogue the losses, recall that fishing is an important part of the Gulf Coast economy, and a disruption to it hurts people in real ways. 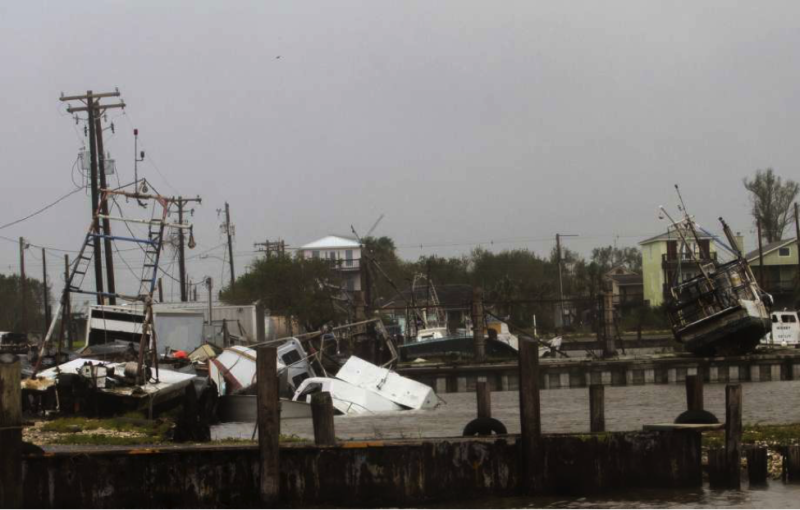 So what does happen to Gulf Coast fisheries after a hurricane? Not much that’s good. Too much fresh water from rain and storm surge kills oyster beds, which is a catastrophe both for oysterers and animals that use the reefs to feed and reproduce. It’s still too early for much news about commercial fishers in Florida, but judging by the destruction of the lower Keys, it’s going to be a tough season. Ninety percent of pink shrimp comes from the west coast of Florida, which is one of the worst-affected areas. Lastly, and perhaps most obviously, hurricanes damage boats, piers, and processing plants, though at least in Texas, it looks like the shrimp fishery was mostly spared. Undamaged boats still suffer, though, because dangerous conditions linger. In the case of Harvey, boats were stuck for about a week. On average, a docked vessel loses $3,500 per day in revenue. Moreover, at least in the case of shrimp, the most profitable months are July, August, and September. …and there’s more. (Of course there’s more.) While it’s difficult to quantify in dollars and immediate impacts, hurricanes interrupt natural processes. For example, storm surge tears up seagrass beds; seagrass beds are important places for baby fish to grow to adulthood; seagrasses also help slow storm surge; fewer baby fish means less food for bigger fish to eat; fewer big fish means less to catch; and on and on. Each storm wears away at our environment’s ability to bounce back. While supplies of Gulf seafood may go through a temporary hiccup, ask for Gulf seafood and shrimp by name when you go to grocers or dine out. It’ll help support the fishers and processors, and remind retailers that out of sight isn’t out of mind. Also, even if you don’t see fresh Gulf seafood at your fishmonger, frozen will still be available, and according to tons of reputable sources, the quality of frozen is just as good, if not better, than fresh. You can also help by restoring our coastlines, which are showing wear and tear from natural disasters and human development. Get out in the world and volunteer to plant sea and marsh grasses, restore mangroves, or recycle oyster shells and rebuild local reefs, which help insulate our coastal cities from flooding and create vital habitat for fish and wildlife. There’s always something to be done to make a seemingly-untenable situation a little bit better, whether it’s helping your neighbor strip rotting sheetrock, donating diapers (lots of diapers) and cleaning supplies, texting 90999 to give $10 to the Red Cross, asking for and buying local seafood, or shoring up our coasts. The only silver lining to be found in these storms or any other is coming together to do what we can.